A performance artist is attempting to cartwheel from Brighton to London to highlight damage being caused to the UK's coastline. Mark McGowan, 37, from Peckham, claims bylaws stopping people from taking stones from the beach to decorate their gardens should be enforced more firmly. He will set off from Brighton pier on Wednesday with rocks around his ankles. Brighton and Hove City Council insisted that people who take home large numbers of pebbles do face prosecution. A council spokesman said: "We realise that visitors often take a pebble or two as a souvenir and we don't have a problem with this. "We haven't had any incidents of people trying to take buckets or barrow loads of pebbles from the beach. "If we did, we would call the police and take action against them." 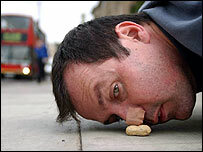 Two years ago Mr McGowan completed the same journey pushing a monkey nut with his nose. Earlier this year he left a tap running in a gallery to highlight water wastage, but was forced to pull the exhibition after being threatened with legal action by Thames Water. This time he will complete the 57 mile (92km) journey with 12lb (5kg) rocks around his ankles and 18 sticks of Brighton rock taped across his face. He said: "It is a long way to cartwheel but I am up for the event even though I am not a great cart wheeler. "Other environmental groups are probably too busy to tackle a local issue such as this, but it could have global consequences." It should take Mr McGowan two weeks to complete the event.